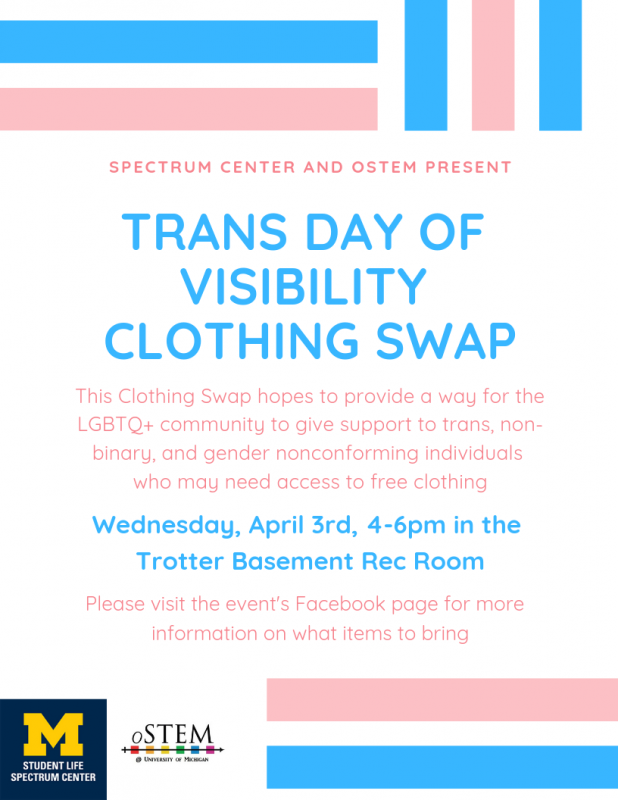 In honor of Trans Day of Visibility, the Spectrum Center and oSTEM will be hosting a clothing swap, as a way for the LGBTQ+ community to provide support to trans, non-binary, and gender nonconforming individuals who may be in need of access to free clothing. 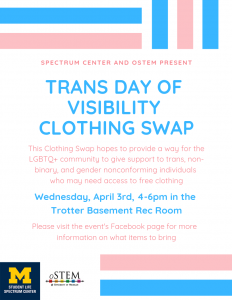 The Clothing Swap will be held on Wednesday, April 3rd from 4-6pm in the Trotter Basement Rec Room. Attendees can bring whatever clothes they want, as long as they fit with the rules listed below. 1. If you are bringing clothes, they must be clean and in good quality: no tears, rips, or stains please! 2. Please do not bring any underwear or used swimsuits. 3. Binders and bras are okay to bring, as long as they have been gently used or are new items. 4. For the first 15 minutes of the event, students will be able to browse and “window shop” but not take any clothes. We want everyone to have time to lay out their clothes before people begin choosing items! 5. There will be two dressing rooms available to try on clothing. 6. If there are leftover items available at the end of the event, we will have a donation bag/box for anything you would like to donate. Spectrum will donate these items for you to a local center!